John A. Ruskamp Jr., Ed.D., reports that he has identified an outstanding, history-changing treasure hidden in plain sight. High above a walking path in Albuquerque’s Petroglyph National Monument, Ruskamp spotted petroglyphs that struck him as unusual. After consulting with experts on Native American rock writing and ancient Chinese scripts to corroborate his analysis, he has concluded that the readable message preserved by these petroglyphs was likely inscribed by a group of Chinese explorers thousands of years ago. On the fringe of archaeology have long been claims that the Chinese reached North America long before Europeans. With some renowned experts taking interest in Ruskamp’s discovery, those claims may be working their way from the fringe to the core. It doesn’t mean our history textbooks will change tomorrow. Anything short of discovering an undisturbed early Asiatic relic or village in the Americas may fail to convince those archaeologists who have dogmatically rejected evidence of an ancient Chinese presence in the New World, said Ruskamp. But, the disparate and widespread symbols he has found show many indications of authenticity. They have the potential to inspire a more serious investigation into early trans-Pacific interaction. To date, Ruskamp has identified over 82 petroglyphs matching unique ancient Chinese scripts not only at multiple sites in Albuquerque, New Mexico, but also nearby in Arizona, as well as in Utah, Nevada, California, Oklahoma, and Ontario. Collectively, he believes that most of these artifacts were created by an early Chinese exploratory expedition, although some appear to be reproductions made by Native people for their own purposes. One of Ruskamp’s staunchest supporters has been David N. Keightley, Ph.D., a MacArthur Foundation Genius Award recipient who is considered by many to be the leading analyst in America of early Chinese oracle-bone writings. Keightley has helped Ruskamp decipher the scripts he has identified. One ancient message, preserved by three Arizona cartouche petroglyphs, translates as: “Set apart (for) 10 years together; declaring (to) return, (the) journey completed, (to the) house of the Sun; (the) journey completed together.” At the end of this text is an unidentified character that may be the author’s signature. The oracle-bone style of writing employed for creating a number of these ancient petroglyph scripts disappeared by royal decree from mankind’s memory around 1046 B.C., following the fall of the Shang Dynasty. It remained an unknown and totally forgotten form of writing until it was rediscovered in A.D. 1899 at Anyang, China. Ruskamp thus concluded that the mixed styles of Chinese scripts found in these Arizona petroglyphs indicates that they were made during a transitional period of writing in China, not long after 1046 B.C. 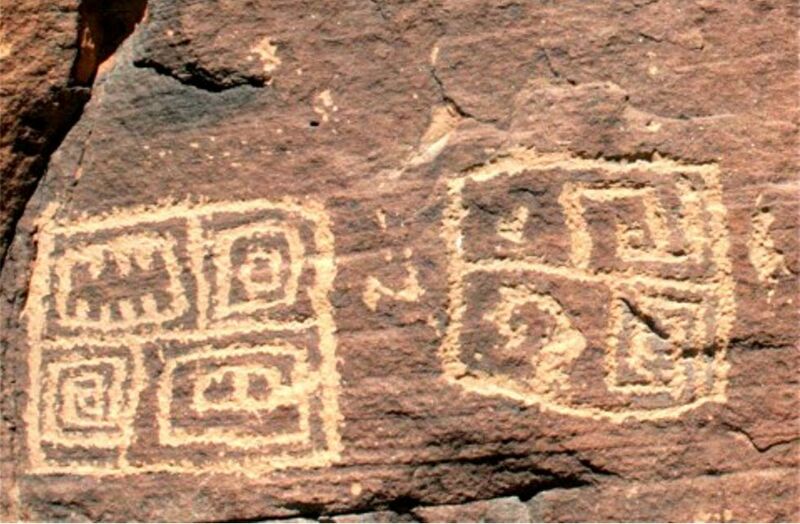 The Albuquerque petroglyphs use both Seal era and Bronze era Chinese scripts, suggesting they were also written during a transitional period in Chinese calligraphy, likely between 1046 B.C. and 475 B.C. The use of the title “Da” before the name “Jiă,” suggests a date close to the end of the Shang Dynasty in 1046 B.C., as this appellation emerged during that time period and was replaced shortly thereafter. It is difficult to physically date petroglyphs with absolute certainty, notes Ruskamp. Yet the syntax and mix of Chinese scripts found at these two locations correspond to what experts would expect explorers from China to use some 2,500 years ago. For example, the Arizona ranch petroglyphs are divided into three sections each enclosed in a square known as a cartouche. Two of the cartouches are numbered; one with the Chinese script for “one” placed beneath it and in a similar manner the second cartouche has the ancient Chinese script meaning “second” inscribed beneath it. Together these numeric figures indicate the order in which these images should be read. Importantly, the cartouches are thus shown to be read in the traditional Chinese manner, from right to left. The first two cartouches are rotated 90 degrees to the left of vertical and the third is rotated 90 degrees to the right. “The deliberate rotation of these writings, both to the left and right of vertical by an equal number of degrees, endorses their authenticity, for the rotation of individual scripts by Chinese calligraphers is well-documented,” wrote Ruskamp. Some of the symbols found in the petroglyphs are common to both Chinese script and ancient Native American writing. 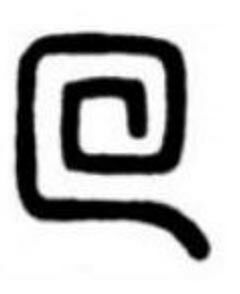 For instance, “The Chinese petroglyph figure of Jiu conveys the idea of “togetherness,” in much the same manner as the Nakwach symbol is now, and has been in the past, understood by the Hopi,” wrote Ruskamp. He published the paper on his website, Asiaticechoes.org, in April and it is currently under peer review. Last October, he began presenting his findings in speaking engagements, including most recently to the Association of American Geographers in Chicago. He will next present at a meeting of the Little Colorado River Chapter of the Arizona Archaeology Society in Springerville, Arizona, on May 18. The editors of the journal Pre-Columbiana have confirmed they will soon publish Ruskamp’s article. The journal is edited by Professor Emeritus Stephen C. Jett, Ph.D., University of California–Davis, with the assistance of an editorial board of distinguished professional scholars, and is dedicated to exploring Pre-Columbian transoceanic contact. A retired educator, statistician, and analytical chemist, Ruskamp pursued his study of petroglyphs as a hobby—little expecting to find what may lead to a great shift in how we view both American and Chinese history. The article ‘ New Evidence Ancient Chinese Explorers Landed in America Excites Experts ’ was originally published on The Epoch Times and has been republished with permission. The discussion about possible very early Chinese exploration in the Americas is not convincing. The location of these glyphs far distant from the Pacific Ocean would lead one to believe that other glyphs much closer to, let's say, modern southern California or western Mexico, should have long since been found. None have! Yes, a so-called "anchor" supposedly from a Chinese ship was found off Santa Barbara, but even if true it would be far more recent than the New Mexico petroglyphs. Could've arrived there by trade. Native Americans originated in East Asia and migrations across the Bering Strait never actually ended. They even continue today. Did the Chinese reach the Americas? Absolutely no. Did the East Asians reach the Americas? Absolutely yes. We know that. You might consider reading Gavin Menzies' book "1421", or have a look at his website "www.1421.tv". Mr. Menzies was (I suppose still is!) a navigator, and used his knowledge to track Chinese voyages prior to the European "discovery" voyages. Interesting reading indeed, and he makes a very good case for the European explorers(?) using Chinese maps to guide their travels. These Chinese were not explorers, they were immigrants that became the different tribes of American Indians. They came across through Alaska and migrated throughout North America, and are now what we call American Indians.